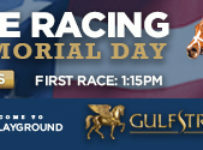 Gulfstream Park will resume racing on Thursday with nine races and first post of 1:15 p.m. The Thursday card has a carryover of $50,692 on the Rainbow 6, on races four through nine. Thursday will be the 51st day of the summer meet that will end on Saturday Oct. 1. 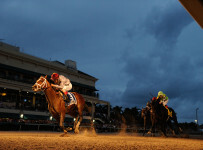 The Gulfstream Park West meet, held at Calder, will begin on Wednesday Oct. 5. The 40-day meet will run through Nov. 27, mostly with a Wednesday through Sunday schedule. The Thursday card will be Gulfstream’s first since Sunday Sept. 18, when Defying Gravity and Francesco Appeal were impressive winners. Defying Gravity (Photo on home page) overcame a slow pace to capture her sixth straight victory with a late rally in the featured ninth race. The 5-year-old mare, who is owned by trainer Jose Pinchin and Kenneth Doyen, prevailed by a length in the $37,000 optional claiming allowance, running a mile on the firm turf in 1:36.93. Cornelio Velasquez, who has been aboard for all six victories, rated Defying Gravity a few lengths off pacesetter Reagan’s Odyssey, who set pedestrian fractions of 25.51, 49.57 and 1:12.93 during the first six furlongs. The pacesetter appeared to be getting away from the 4-5 favorite entering the stretch. But Defying Gravity was able to mount an extended drive to capture her sixth straight race and 11th victory overall. The stretch-running Defying Gravity began her winning streak in a $10,000 claiming event May 15 and has been victorious in three straight optional claiming allowances. Pinchin also trains the undefeated 2-year-old Three Rules, who on Oct. 1 is scheduled to make a bid for a Florida Sire Stakes sweep in the $500,000 In Reality. The son of Gone Astray has captured his four career starts by a combined 21 ½ lengths. That includes the first two legs of the 2-year-old male division of the Sire Stakes, which is restricted to horses sired by accredited stallions standing in Florida. 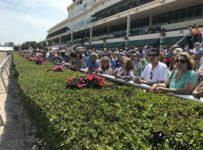 Three Rules won by seven lengths in the $200,000 Dr. Fager at six furlongs Aug. 6 and by 5 ½ lengths in the $300,000 Affirmed at seven furlongs Sept. 3. Three Rules won his debut June 10 by 3 ½ lengths and the non-restricted Birdonthewire Stakes July 2 by five lengths. Velasquez has been aboard for all four dominating wins. Three Rules will be asked to negotiate two turns for the first time in the 1 1/16-mile In Reality. Francesco Appeal, who finished third to Three Rules in the Birdonthewire, returned on Sunday after an 11-week absence from competition and was an impressive winner in the seventh race. Francesco Appeal beat Red Crescent by 2 ½ lengths in the six-furlong allowance/optional claiming race for 2-year-olds. The win was the second in three career starts for Francesco Appeal, who is owned by Monarch Stable and trained by Larry Pilotti. Francesco Appeal was the even-money favorite and Red Crescent was 5-1 in the seven-horse field. Red Crescent, with Edgard Zayas riding, led Successful Appeal by a head after a half mile in 45.06 seconds. Francesco Appeal, ridden by five-pound apprentice Lane Luzzi, took the lead early in the stretch and pulled away. His winning time on the track listed as fast was 1:10.40—very solid for a 2-year-old. Thanks God, the third place finisher, came in 8 1/2 lengths behind Red Crescent. 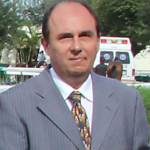 Francesco Appeal won his debut race on May 12 at Gulfstream at 4 ½ furlongs. He won by 7 ½ lengths over Draft Beer, who was a next-out winner. In the Birdonthewire, at 5 ½ furlongs, Three Rules was the 6-5 favorite and Francesco Appeal was the 2-1 second choice in a nine-horse field. Francesco Appeal led after a half mile but was caught by Three Rules and then edged by a neck at the wire by 73-1 shot Sondino. Three Rules finished five lengths ahead of Sondino. An indication of the strength of the Birdonthewire is that Gunnevera finished fourth, one and one-half lengths behind Francesco Appeal. In his next start, Gunnevera won the 6 ½ furlong Saratoga Special (Grade 2) at Saratoga. Javier Castellano rode for trainer Antonio Sano and owner Peacock Racing Stables. Francesco Appeal, a son of Successful Appeal, and Gunnevera, a son of Dialed In, are Kentucky-breds and thus not eligible for the Florida Sire Stakes races. In 2011, Dialed In won the 1 1/8 mile Florida Derby (Grade 1) and had a deep-closer style that earned him a large fan following before injuries forced him to retire late that year. Gunnevera’s breeding suggests that he is suited for two-turn races. This fall there are 1 1/16 mile graded stakes at tracks in Kentucky, New York and Louisiana that could fit his late-running style. Francesco Appeal could find opportunities in non-restricted overnight stakes and in allowance races at the GP West meet.